The Waverley Abbey Insight Series is based on CWR's one-day seminars held at Waverley Abbey house to give insight into key issues that many people struggle with today. At some point in our lives almost all of us will face bitter disappointment in one area or another. Hopes and dreams lie shattered at our feet. We may feel despairing, disillusioned, dejected. Where is God in all this? 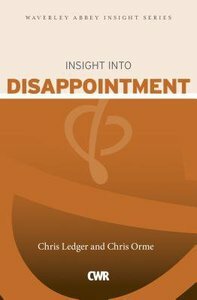 This book aims to recognise and validate the pain and impact shattered dreams have on us; to bring God's hope into the midst of our confusion and, especially, to emphasise the power of our response to disappointment. You can examine the choices we make, the grace we receive and the transformation we experience as God's love strengthens us to be risk takers once again and to press on. About "Insight Into Disappointment (Waverley Abbey Insight Series)"
Christine worked for 16 years as a counsellor, supervisor and trainer in the NHS, and is now in private practice. She enjoys speaking at Christian meetings both here and abroad, and leads CWR training days. Besides 'Inspiring Women Every Day', Chris has written two books, and co-authored the CWR 'Insight' series books on anger, anxiety and self-esteem. Christine leads the Prayer Ministry Team at Greyfriars Church, Reading, where she and husband, John, are Licensed Lay Ministers. With a heart to reach the ordinary person in the street with the love of Jesus, she co-leads Prayer Café outreach. Having two married daughters and five grandchildren to have fun with, life is never dull!